As the NFL season comes to a close this weekend, only three playoffs spots remain for the taking in Week 17. Many coaches will experience the stress of trying to get to the playoffs and eventually the Super Bowl. For those who fall short, however, there will be a different kind of stress—worrying about getting fired. This post works to assess how worried these coaches should be. In October, we made a model concerning the likelihood that the front office would fire its respective coach by the end of the year. Before delving into the updated results, we should note that we made a few changes to our model. We eliminated the variables that we found were no longer significant enough to include, while keeping the ROC pretty constant at 0.89. Our first addition to the model was inspired by a post on fivethirtyeight.com by Neil Paine, looking at whether Sacramento Kings coach Mike Malone deserved to be fired. In post, Paine “couldn’t find a statistically significant effect for how being hired by a different GM affects coaching dismissal rates” in the NBA. In the NFL, on the other hand, there was a very significant effect – the coefficient for the dummy variable about whether there had been a GM change during a coach’s tenure in our logistic regression model was 0.648, with a p-value of 0.008826. Another factor that we added was the difference in winning percentage from the season before the coach was first hired. We had found previously (to our surprise) that a change in winning percentage between seasons was not significant. However, the winning percentage from the season before a coach was hired is often representative of expectations that the GM/owner might have for a coach. For example, when the Bears fired Lovie Smith and hired Trestman after going 10-6, they clearly expected Trestman to lead the Bears to the playoffs or better. Meanwhile, when the Jaguars hired Bradley after a 2-14 season, they weren’t expecting to win much anytime soon. An updated table listing the factors we included as well as their effects and significance levels is shown below. This weekend will be critical in predicting the final probability that a coach will be fired. There is one game in particular that we will focus on—the Panthers vs. Falcons game, the winner of which will become the second team in NFL history to finish under .500 and make the playoffs. As the announcers were previewing this game at the end of the last weekend’s action, they noted on several occasions that fans wouldn’t care about losing record as long as they made the playoffs. The same goes for the coaches. For either Ron Rivera or Mike Smith, making the postseason could well be the difference between getting fired and staying on as coach. Below is a table of all possible outcomes for this game. Neither coach is a sure thing to be fired if they lose, although they should feel a lot more secure with their job with a win. Rivera, despite having a great season last year, didn’t have a strong first two seasons and is operating under a new GM, which, as mentioned before, increases the likelihood of being fired. Smith will be coming off back-to-back losing seasons, but he still has a career winning percentage with the Falcons of nearly .600, and with 66 wins he is the winningest coach in Falcons history. There aren’t many other games this weekend that could greatly affect a coach’s chances of getting fired—the reason being that most the other coaches involved in a playoff race don’t have to worry about their job security. In the AFC, the teams fighting for a playoff spot are San Diego, Kansas City, Baltimore, and Houston. San Diego and Kansas City have second-year coaches, while Houston has a first-year coach—making them all much less likely to change coaches. And John Harbaugh has won a ring with the Ravens, so it’s not likely they’ll fire him. And in the NFC, the playoff teams are basically locked in except for the NFC South, which we already discussed. Finally, among the teams who aren’t going to make the playoffs, there are only a few “sure” firings by our model but many potential ones. Rex Ryan has dug himself into a deep hole, and seems likely to be fired, despite concerns over whether it’s a good idea or not. The Raiders, of course, already fired their coach after four games, so those probabilities are really 100% (our model looks for change in head coach either during the year or after it, so it doesn’t know that he was already fired). Since firing him and burying a football, they have rebounded nicely for a team many thought had a chance of not winning a single game, which is why those probabilities are lower than one might think. Two first-year coaches (Lovie Smith of the Buccaneers and Ken Whisenhunt of the Titans) are also in a bad spot, due to massively disappointing seasons. The fact that they are first-year coaches is the primary significant variable working in their favor. A few second-year coaches also have high chances of being fired. Gus Bradley on the Jaguars has compiled a not-so-great record in his first two years, but the team seems content to embark on a multi-year rebuilding path. With the Bears, Trestman is “all but certain to fired”, not exactly the 40% or so chance we give him. However, our model, despite its adjustments, still can’t take into consideration things like locker room issues or whether your team has basically given up on you. With this in mind, Jim Harbaugh’s chances of getting fired are predicted to be only around 10%. However, his firing would seem to be due to a lack of cohesion with the front office rather than any football issues. 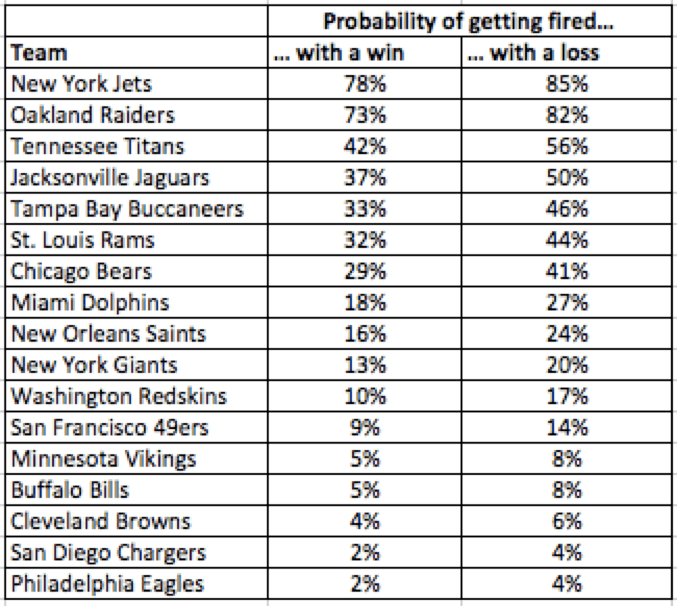 Based on these probabilities and assuming that firings are independent of each other, we would expect that around 4.5 coaches (including Dennis Allen) will be out of work by the end of the season, with a standard deviation of about 1.6 coaches. Each coach can help his odds by winning his last game, but the message is clear: no one’s job is safe, especially if you miss the playoffs. As someone who looks at sports through a strictly literary lense, this article is refreshingly different. If you were interested, the English Premier League in soccer could be an interesting place to build a model. Turnover in that league is brutal and…. Seemingly….. Random.